Greetings again from the darkness. “Made it, Ma. Top of the world!” That line was famously bellowed by James Cagney in the 1949 film WHITE HEAT, and it reasonably could have been shouted behind closed doors, a few years later, by Tab Hunter. Of course, that wouldn’t have been the only thing Mr. Hunter was keeping behind those doors. In his 2005 autobiography, he came out publically as a gay man. Director Jeffrey Schwarz takes that book, and puts a very forthcoming Mr. Hunter in front of the camera, to deliver a fascinating, entertaining and educational glimpse at what it was like to be a movie and musical superstar at a time when being a gay man was not just a social taboo, but actually considered a mental illness. Normally, “talking head” documentaries quickly become tiresome, but now in his 80’s, Mr. Hunter remains an engaging and delightful man, and he is so sincere and upfront in telling his stories, that we couldn’t possibly turn away. In addition, director Schwarz drops in interviews from those who were there. These include: Debbie Reynolds, Connie Stevens, Robert Wagner (filling in his for his deceased wife Natalie Wood), John Waters, George Takei, and Robert Osborne. Each recall moments from real life, with the studio publicity romances (Reynolds, Stevens, Wood) providing the touch of melancholy that brings focus to the matter at hand. Another entertaining touch added by Schwarz is his use of actual dialogue snippets from Hunter’s films to deliver punch to a point – sometimes comedic, sometimes more serious. Never succumbing to the career retrospective approach, the film does offer significant film clips, photographs and recollections of Hunter’s unique career that found him #1 at the Box Office, as well as #1 on the Pop Music Charts (his recording of “Young Love” knocked Elvis off the top of the charts). The film could also serve as a historical documenting of the Hollywood Studio system, as Hunter’s success with Warner Brothers was never to be duplicated once he gained his contractual release (through buyout). We do go through the career re-birth brought about by Hunter’s work in the John Waters offbeat classic Polyster, where the former matinee idol finds himself making out on screen with Divine, the 300 pound transvestite who was a fixture in Waters’ films. Surprisingly, it’s Hunter’s fearless approach to the material that makes it click. But beyond the Hollywood insight, the film is most effectively the story of a man who, because of his era, had to be one person in public and another behind the closed doors. Hunter describes this as “being rewarded for pretending to be someone you aren’t”. He speaks frankly about his relationship with Anthony Perkins, as well as a couple of other serious relationships. We also learn about his childhood, when he had an abusive father and was close to his older brother, who later died in Vietnam. Hunter speaks of being “lost as a kid”. Beyond the Hollywood years, it’s fascinating to hear Hunter speak of his time on the Dinner Theatre circuit, where he put up with the travel and drudgery so that he could pay the bills and care for his sick mother. We also learn that in addition to his staggering good looks, his on screen appeal, and his musical talent, Hunter was also a world class figure skater and competitive equestrian horse jumper. 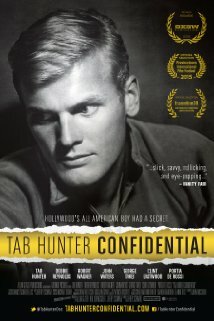 Yep, Tab Hunter is pretty much the guy we would all despise … if he just wasn’t so darned nice and likeable! This entry was posted on Sunday, October 18th, 2015 at 4:38 pm and is filed under Documentary. You can follow any responses to this entry through the RSS 2.0 feed. You can leave a response, or trackback from your own site.